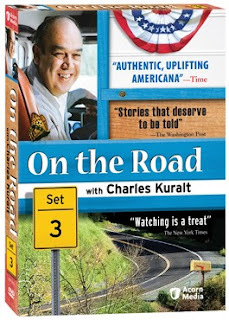 For over 20 years, Charles Kuralt took his motor homes (he eventually wore out 6 of them!) along the back roads of America to visit people and places that were off the beaten path. In On the Road, Set 3, we get to follow along as Kuralt discovers what's "just around the bend." On the Road became a regular feature on CBS Evening News with Walter Cronkite and won an Emmy and three Peabody awards. This DVD set features 3 volumes of stories. There are a total of 14 episodes, each containing 3-5 segments. A bonus feature includes a 55 minute interview with Kuralt's longtime cameraman, Isadore Bleckman. Each disk also contains some Road Updates on the people and stories featured, including websites where available. Since most of the episodes appear to be from the 1970s, it's good to find out what happened to some of the more memorable characters. There is also a biography of Kuralt. I really enjoyed the story of Moses Walters, an elderly mailman in Magoffin County, Kentucky who delivered the mail by mule for over 50 years. I was most intrigued by this, because my mother is actually a mail carrier in that same county today. I'm sure there are some roads where she wishes she could trade in her car for a mule! I was happy to find out that Moses Walters achieved fame late in life by virtue of being profiled by Charles Kuralt (although I'm sure he never sought the recognition!). That is the beauty of Kuralt's work. He looked for ordinary people doing ordinary things, and allowed the rest of America to become acquainted with them, too. In the days before the Internet gave everyone his or her own website, video channel and podcast, Kuralt showcased what made people special and unique. I'm glad I was able to see the varied personalities and locations in this wonderful set of stories.